Many cities, especially in northern states, have taken old railroad beds and turned them into recreational trails suitable for traveling on foot, bike, roller blades, or skateboards. One of the most prominent Rails to Trails projects is the Paul BunyanTrail in the northern woods region of Minnesota. Flowers line the paved Paul Bunyan Trail in Minnesota. 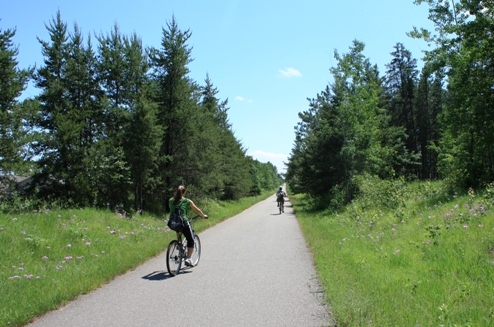 Bikes or rollerblades can be rented for summer trips, ands nowmobiling is a favorite winter activity along the trail. Since we didn’t have our own, we rented bicycles to scope out the scenery. 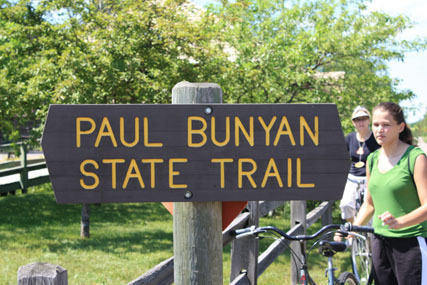 The Paul Bunyan Trail is the longest Bike trail in Minnesota at 112-miles. It connects the Heartland Trail, the Blue Ox Trail and the Cuyuna State Trail.. With the paving of the 19-mile segment from Guthrie south through Laporte toward Walker, completed in 2010, the Paul Bunyan Trail now yields a continuously paved trail from Brainerd to Lake Bemidji State Park. A long trail, you can ride any portion or all of it. The terrain of the Paul Bunyan Trail ranges from flat and open to hilly and scenic—and we experienced both on our journey. Along the trail there are many areas to stop and rest and enjoy nature in Northern Minnesota. Typical distance between the 14 connected towns is six to nine miles, so you can easily find a place to stop and eat or rest awhile. In summer, you might even take a dip in any of the numerous lakes that the Trail parallels. Starting from Pequot Lake, we followed a relatively level route along the highway. On the other side were meadows filled with purple flowers waving in the breeze. 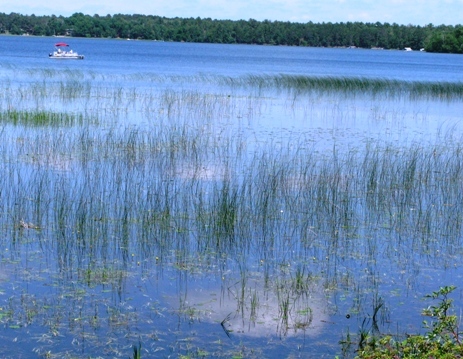 After a couple of miles the landscape opened up, and we could see Gull Lake as we rode toward the town of Nisswa. Piers and boats indicated that this was a popular vacation area. Lovely lake views contrasted with stands of pine, fir, birch, maple, and other trees that lined the trail. Gull Lake provides a refreshing scene along the way. In Nisswa, we stopped for a brief rest near the Visitor Information Center. With temperatures in the upper 80s and plenty of humidity after two days of rain, we needed a hydration break. A bright green railroad car, antique machines, and a blue cow caught our attention, so we went across the street to check them out. 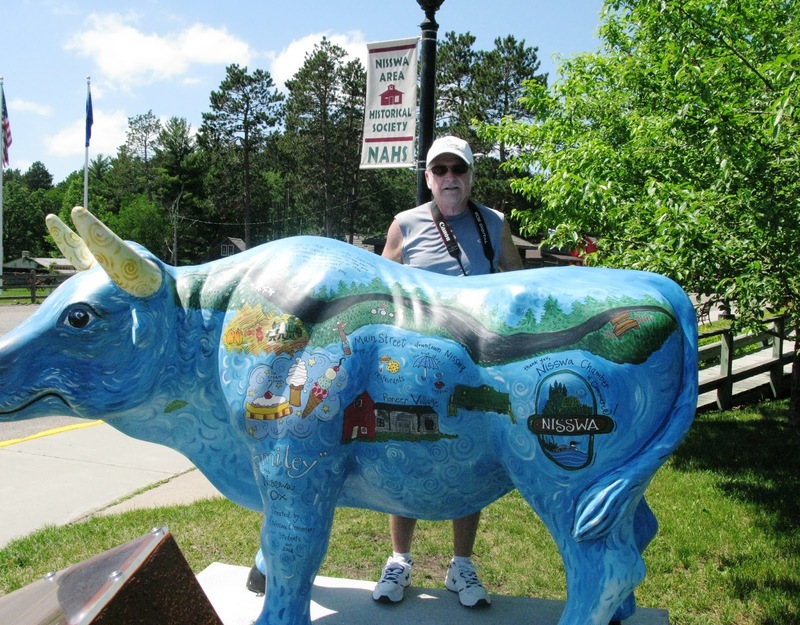 This blue cow welcomes visitors to the town of Nisswa along the trail. If we had continued, we could ride all the way to Brainerd. Instead, we took a hilly path on back roads to Grand View Lodge, where we were staying. We learned to pump up bike speed prior to approaching each hill—to get a running start on the incline. Coasting down was the reward. It was challenging enough for a good ride but not so difficult that a casual rider couldn’t enjoy the activity and scenery. For a longer journey or family vacation, you could pitch a tent and camp at designated areas along the way. For those who prefer more comforts, the tree-lined trail is in the heart of resort country—check out resorts and hotels along the Paul Bunyan Trail. Victoria Falls is called "Smoke That Thunders"